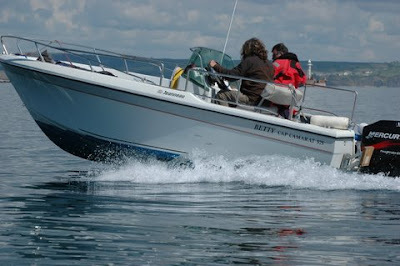 My boat "Betty" is a cap cammerat 5.75 , a Boston whaler type, centre consul boat, powered by an environmentally friendly 115 hp out board engine. She is quick over the water and a stable platform when drifting or at anchor, ideal for saltwater fly fishing. In the boat you can explore inshore and offshore ridges and shoals and visit shore areas inaccessible by any other means. The boat has VHF radio, Sat Nav and fish finding electronics. A full manifest of safety gear, is fully insured, and is MCA coded for charter operation. We also carry a range of lure fishing equipment. To find out when I'm available or to see if I'm free for your preferred date you can phone me on 07855196332 or email me via the contact page.